Settle Now to Be Men and Women of Faith. 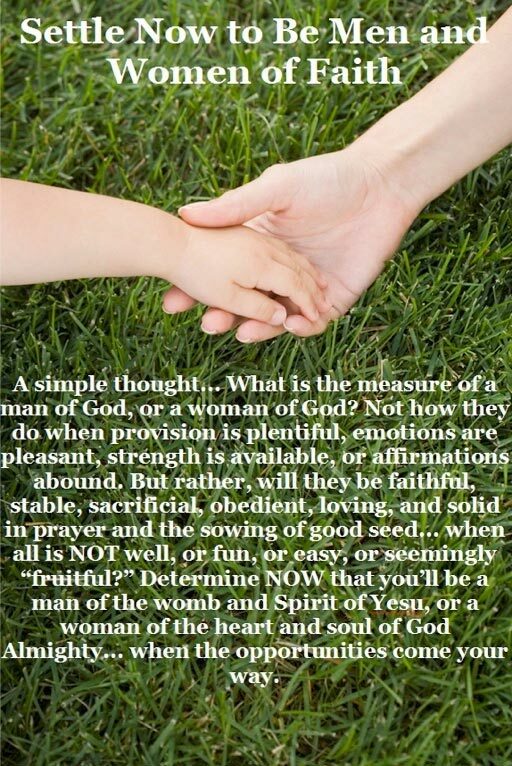 A simple thought... What is the measure of a man of God, or a woman of God? Not how they do when provision is plentiful, emotions are pleasant, strength is available, or affirmations abound. But rather, will they be faithful, stable, sacrificial, obedient, loving and solid in prayer and the sowing of good seed... when all is NOT well, or fun, or easy, or seemingly "fruitful?" Determine NOW that you'll be a man of the womb and Spirit of Yesu, or a woman of the heart and soul of God Almighty... when the opportunities come your way.